Season 2 of Dallas started up again last week and at least for now, Larry Hagman is still with fans onscreen as the iconic J.R. Ewing. He is joined by actors from the old series Linda Grey and Patrick Duffy. But this reboot has plenty of fresh faces for the series as well including Josh Henderson as Larry Hagman's son, J.R. III, Jesse Metcalfe as Patrick Duffy's adopted son and Jordana Brewster, who plays the daughter of the Ewing's cook. 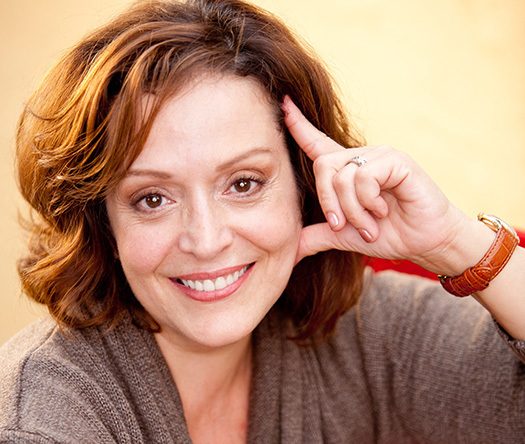 In the role of her mom is Marlene Forte who has played her share of maids and housekeepers. But she doesn't mind being typecast. In a recent one-on-one interview, we discussed the role of Latinos on Dallas and working with Larry Hagman. Marlene is a veteran character actress who has been in the business for over 20 years. When she heard there might be a part for her in the reboot of Dallas, she was confused thinking, "A Latina in Dallas, really? There were no Latinas in Dallas." But after much encouragement from her manager she read the script and fell instantly in love with Carmen Ramos, the Southfork cook. At her audition she said, "She's my mom. I'm playing my mom. It was very easy for me… I got her rhythm immediately. I walked in the room and met [Executive Producers] Cynthia [Cidre] and Michael [Robin]... I did my little this and it was very easy." She added, "By the time I got to the car they had booked me… I guess it was mine. It was like Cinderella's slipper and I just fit right in there." Marlene talked about the character of Carmen and why she felt right for the role. "She is the housekeeper, but she also runs that house. There's something — a strength and a pushiness about a person who's brought you up. So this woman has brought up all those kids including her own. She's been part of this family for over 16 years and this is her home. She doesn't feel submissive to them. She's almost the only one that tells them what to do." She continued, "She's not afraid of J.R. She's definitely not afraid of the kids. Those are her kids. So it was that assertiveness. And I also found her sense of humor, because I think she's very funny. She's the only one that doesn't lie in that house. Everybody's got something to lie about but she's got a moral compass. She's not below any of this, she's actually above it all. She has a very, very strong faith and she's very loyal." Unlike the original version of Dallas, this reboot has a large number of Latino characters. Shee discussed how that feels as an actress from that community, "It's delicious. It's exciting… The lovely thing about this script is that we are woven into the fabric of this script very much the way that the Latino culture is woven into the fabric of this country. We're not separate from it. We're woven into it. We are in your homes. We park your cars... There is a reality to that." She credits Cynthia, also a Latina, with bringing that sensibility to the show. "I was born in Cuba, but I was raised American. I am an American. And I'm very much a Cuban lady, who's an American. So it's part of my consciousness, not going, 'I'm going to see a Latin movie today' or 'I'm going to hang out with my Latin friends.' I don't do that. We don't compartmentalize like that. It's so easy in this show. It's just part of the story and I think there's going to be a lot more to come. And I really hope that other shows take a little nod from that. We're part of the country. Part of the fabric that makes it stronger. It's not a big patchwork and the Latinos are over there. We're all over the place." Sadly Larry Hagman, who had been fighting cancer since before the new Dallas began taping, passed away in November 2012. He appears in the first few episodes of Season 2, but J.R. will be laid to rest in the eighth show this year. Marlene talked about working with Larry. "It was a treat. He had sparkly eyes. He sparkled from within, even at 79 when we met him." She continued, "He was a very kind, loving human being. I like to say that as evil as J.R. can be, the other end of the spectrum is how wonderful a person Larry Hagman was. Beloved by everyone. Fun, always. Even when he was totally ill and going to chemo and shooting his days, that guy never lost his sparkle, never lost his smile, his love for what he did. He was so happy to be working all the time. That's the way I want to go. Eighty-one on the set, all the way to the end." She says the mood on the set is melancholy now without Larry. They all knew he was ill from the start, so it was not a surprise, but knowing it would come didn't make it any easier. She noted, "We had the enormous blessing to have Larry Hagman with us, for this reboot as long as we did. And that will carry us for a long time, definitely through this season… There's a little hole in our hearts but we're working hard and moving forward because that's how he was every day that he showed up on the set. He was very ill, so if he could do this, we can totally carry this torch forward until the audience decides they don't want to see us anymore." Marlene discussed what it was like on the set the day they shot J.R.'s burial. "It was very sad for all of us. Everybody showed up. There's some secret guests coming up from the show's past. And it was really something. It was sad but not weepy. We were going through this and he was still there with us. When we filmed that scene when the casket gets lowered into the ground, there wasn't a dry eye to be seen." Watch Marlene on Dallas Monday nights at 9 p.m. EST/8 p.m. Central on TNT.